Week 13 in the NFL coming up today!!! Who will cover and who will not??? Betting is 50/50 with the line moving from -6.5-113 to -8 for Seattle. Models favor Carolina, Variables favor Carolina and public betting is dead even. If the public betting was favoring Carolina I would consider wagering on Carolina. But at 50/50 there is no edge. So far me the game is a pass. We ended up with 9 one unit plays going 4-5 for the day. Certainly, nothing to write home about. In College football, we went 2-0 winning with Navy Under and also Oklahoma -11.5. In the NBA we went 0-1 losing with Miami +5.5. In the NHL we went 1-2 winning with Winnipeg +150 and losing with Detroit and Carolina. 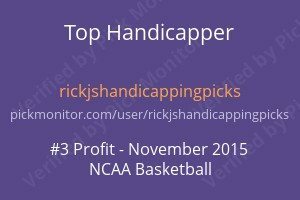 Finally, in College hoop, we went 1-2 winning with W. Kentucky +7.5 and losing with Virgina -9 and Portland +5. If that does not get you dizzy nothing will! I am fading Green Bay and not with any of the top 5. They made a recovery last week going 5-0 bringing their record to 23-36-2. Still under 40% at 38.89%! Typically you want to find yourself on the other side of the games with over 60% betting and also be on the other side of the Hilton top 5. 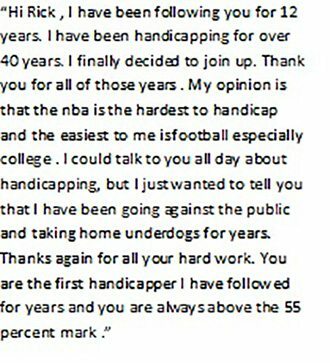 If you did this for the season your handicapping would improve significantly in the NFL. For Subscribers so far today I have sent out no plays and none are carried over.